Cosmopolitan included a brief shout-out to RP in this month's issue! 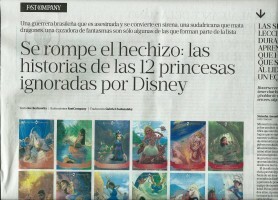 A reader alerted us to RP making the news in Argentina! Co.Create did a followup piece on RP, and it's pretty great. RP featured in high school newspaper! An RP reader in high school did a writeup of the project for her school newspaper. Rad! 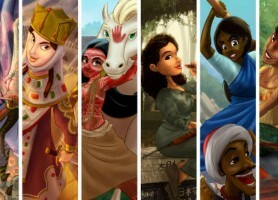 This is a very sweet writeup of Rejected Princesses from a Muslim perspective. The writer, Sya Taha, picked up on little bit of nuance I tried to sprinkle throughout the entries (such as Naziq al-Abid's anti-veil depiction not being a sweeping anti-veil statement), for which I am thankful. Suparna Dutt at Gulf News did an incredibly flattering writeup of RP -- best part for me is when she described the writing style as "reckless" and "American." Speaking at The F Word! 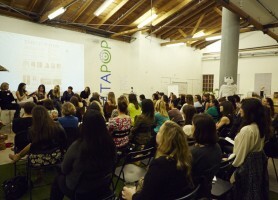 If you're in LA, I'll be speaking at this cool event on November 19. You can come, if you'd like! After an interview with NPR’s All Things Considered, I thought it best to post a followup. RP on Ask Me Another! NPR's puzzle / trivia / humor podcast Ask Me Another had me on for their Meet The Expert section. I even hosted a game of "Two Truths and a Lie, Rejected Princesses Edition"! The RP book got covered by Bustle! I've got more details on where you can see me in Durham, Atlanta, Louisville, Chicago, DC, NYC, and Boston! Biography.com has a guest piece today by yours truly, with brief blurbs about several of the women covered on this site and in the book. RP on You & Me This Morning! I talk with the women of You and Me This Morning about Rejected Princesses. There is also a dog. 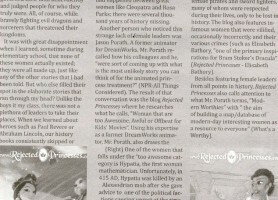 The RP book got covered by EW! Instigated a massive "women's war" against British taxation, the effect of which was one part protest movement, one part comedy roast, and one part block party. When enemies invaded her town while her husband was on lunch break, she grabbed a nearby pestle and saved the day by achieving the high score in soldier whack-a-mole. After disguising herself as a man to be the physician women needed, she was put on trial - and won. Mexican revolutionary who bombed bridges, led hundreds of women into battle, and was instrumental in turning the tide of the war for the revolutionaries. The reluctant royal who became the Maori's greatest leader. When the true king of the Scots came to reclaim the throne, this spirited woman went up against her husband to back her chosen sovereign.